The following allows you to boot from an ISO with root persistence (or home persistence) for AntiX 13 and 14 (not tested on 15). For Antix 15 with Root+Home persistence see blog post here. 1. Copy the ISO file e.g. antiX-13.2_x64-full.iso, to a sub-folder under one of the E2B menu folders - e.g. \_ISO\LINUX\MNU. 4. Edit the .mnu file so that the name of the ISO (highlighted in yellow below) matches your ISO filename (it doesn't matter what the name of the .mnu file is). You can choose Root persistence, Static Root persistence or home persistence by using one of the three lines at the bottom of the menu (in red). Root persistence will be used if you don't uncomment one of the other two lines. Now we need to boot to AntiX twice using this menu to get persistence working - use a real system (I couldn't get it to boot under VBox even if using the from=hd cheat code, VBox crashed). 1.1 AntiX will complain about 'Looking for antiX/homefs.new' - press c to continue twice and boot to Antix Desktop. 1.3 When prompted enter pwd=root - (you will now get a sdb4 is read-only error) - choose ext2 (label=antix) and click OK (see below). 1.4 The next default option will be: action:Create root persistence - OK this and then set the Size - Choose Size (use maximum) - OK - OK - Yes to Proceed. 2.2 Persistence should now be active and it should boot without complaining. 2.3 You should be prompted for new root and demo passwords and then you should see a message that root persistence was enabled - OK this and finally choose your Auto-Save Config preference. 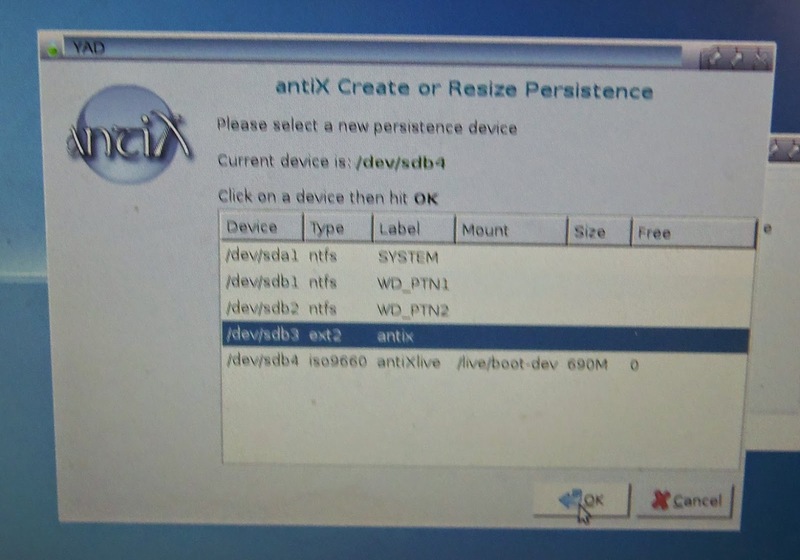 By changing the name of the persistence file, you can have multiple versions of AntiX (e.g. 32-bit and 64-bit) with a different persistence storage for each one. If you wish, you can put the persistence files in another folder and change the set PERS= variable to match the new path. More 'Cheat Codes' are listed here. This is a very new version and there has been a lot of 'behind the scenes' changes due to the use of the new STRINGS.txt feature. This new E2B version uses a STRINGS.txt file to define menu headings, help text, user prompts, etc. About 90% of all text is now in the STRINGS.txt file and so you can easily modify these or translate them to a different language. STRINGS.txt is a UTF-8 file and so will support non-ASCII languages. Most strings are now replaced by $$STRxxxx keywords (where xxxx can be any four characters) - these keywords are replaced with the correct string automatically by E2B when the menu is loaded into memory. You may notice that .mnu and .txt files now use these new $$STRxxxx strings - e.g. If you want to create new .mnu files, you don't use $$STRxxxx keywords (unless you want to), just use normal text in place of the $$STRxxx keyword. Also, if you used any of the .mnu files from the \_ISO\docs\Sample mnu Files folder, they may need updating with the new version from the docs folder in E2B v1.50 (basically remove the /%LANG% portion wherever it is used in a .mnu file). It is also possible to modify the MyE2B.cfg file so you can ask the user which language he wants to use. If you place the STRINGS.txt file in the \_ISO folder, it will override any LANG settings and will always be used. In the future, I hope that we can build up a library of STRINGS.txt files in different languages. To test it, it is best to make a new (reformatted) USB drive - you can add it to your existing E2B drive by overwriting the existing version, but there may be old (unused) copies of various files left on the USB drive. As there will probably be a few small bugs, don't start trying to translate ALL the STRINGS.txt file strings immediately but please report any problems you find ASAP. Also if you have used it a lot and have found no bugs, please also let me know so that I can 'officially' release it and remove the 'beta' status from it. Improved language support for E2B is coming! I am working on a new version of E2B that will have a STRINGS.TXT file which will contain all the words displayed by E2B batch files and menus, etc. There will be no need to change the standard grub4dos batch files or .mnu files or .txt files that are already in E2B. This will make it much easier for anyone to translate E2B into other languages as they just need to edit the file in a new language folder + create a MyE2B.cfg file. This will take a week to do and test, but then I hope to encourage people to submit new language STRINGS.txt files to me, so I can add them to E2B. It will support Chinese and other non-ASCII languages. e.g. The STRINGS.TXT file will contain lines of words/phrases displayed to the user by E2B. You would just need to change these into your own language - e.g. 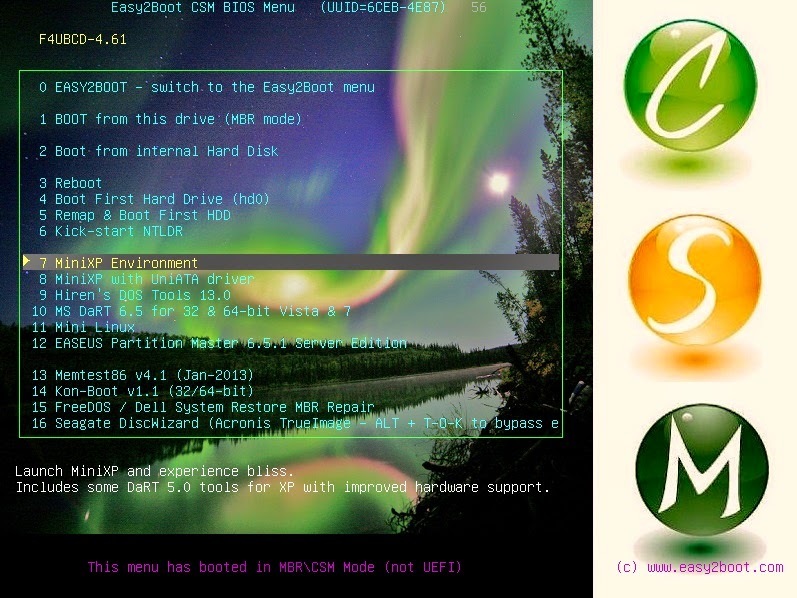 Easy2Boot 1.42a now in Chinese! Thanks to 'Mr Lin', we now have a version of E2B in Chinese! Once you have made your E2B USB drive, simply download and extract the E2B_LANGUAGE_ZH_CN_1.42a.zip file and overwrite the English E2B files. Note that this download contains a \_ISO\MyE2B.cfg file which will replace your MyE2B.cfg file (if you have made one). The MyE2B.cfg file ensures that the \_ISO\e2b\grub\ZH_CN folder is used. The download is now available from the Downloads page. Because Hirens/UBCD4WIN ISOs (e.g. HBCD, DLCD, FalconFour, etc.) contain a mix of DOS applications, linux and Windows, they can be difficult to add to a multiboot USB drive. Note: E2B v1.90+ includes support for WinBuilder-based ISOs - just keep the file extension as .ISO. There are instructions on the Easy2Boot website for adding the ISOs and also some sample .mnu files. If you just want to boot to Mini-XP, you can try just renaming the Hirens ISO with a .isowinvh file extension. E2B v1.78 also supports the .isoHW file extension. This can be used for DLC\DLCD versions which have XP and Mini7/8/10. For Mini7/8/10 the E2B USB drive must be a removable type (or use a Helper USB flash drive). Another way to run a single Hirens ISO with the minimum amount of issues and workarounds is to extract some or all of the files from the ISO file and run it as a 'flat file' installation directly from the USB drive. If your E2B USB drive is formatted as NTFS then you will need to select the DOS NTFS driver when running the DOS applications. As the NTFS driver uses DOS memory, some of the DOS applications won't run if the NTFS driver is also loaded into memory, so even if you extract the ISO files, it does not run very well on an NTFS USB drive and, of course, you can't extract multiple versions to the same E2B USB drive, because they will overwrite each other! 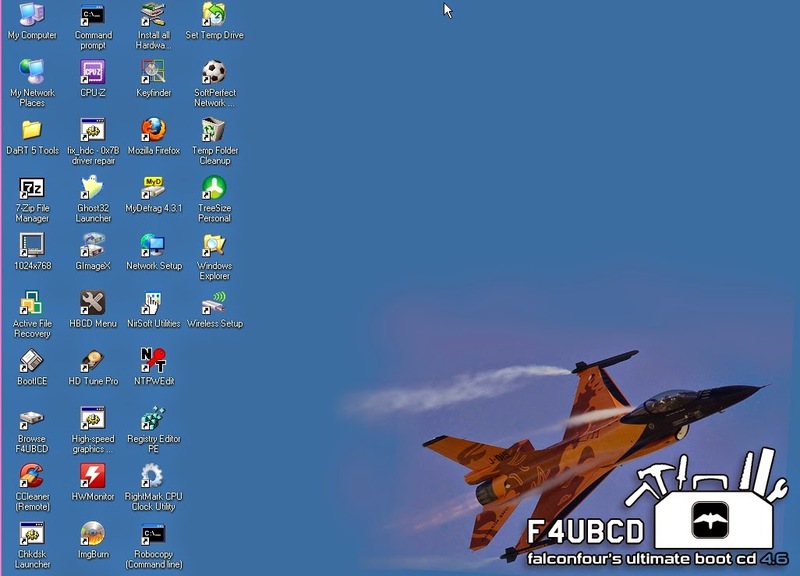 Note: E2B includes special instructions for extracting FalconFours's F4UBCD ISO file - see the \_ISO\docs\Sample mnu files folder for a special F4 .mnu file. DLC.Boot.2015.iso is also 64-bit UEFI bootable if converted to FAT32 .imgPTN (for Mini Windows 8 64-bit). For Sergei Strelec Windows ISOs, use .isofira01 file extension (E2B v1.88+). Drag and drop the .ISO file onto the Windows Desktop MPI_FAT32 shortcut (or MakePartImage shortcut). (if prompted) Answer Y to merge\combine the menu.lst file with the E2B CSM menu.lst file. Copy the new .imgPTN file to your E2B USB drive menu folder (e.g. \_ISO\MAINMENU). Run WinContig or \MAKE_THIS_DRIVE_CONTIGUOUS.cmd to make the .imgPTN file contiguous. If you are not prompted to merge the menu.lst files by the MPI tool, then you will probably get an extra CSM menu item which will then load the HBCD menu. If you find any problems with linux menu entries, try converting the ISO using the MakePartImage Desktop shortcut instead of the MPI_FAT32 shortcut and do NOT auto-correct the menu entries when prompted. If the ISO was designed to be run from a USB drive, the menu entries will not require any 'corrections' to be applied. Some versions of Hirens have a problem with KonBoot in that it only works from a CD but not if booted from a USB drive (it just reboots back to the USB drive again), it can be made to work correctly if you modify the Hirens menu.lst file however (add the lines in red). Kon-Boot 1.1 was the free version that only works for XP. The latest version works with Windows XP through to Win 8.1 and is just $15 to buy. OR you can add the free PassPass software to your E2B drive and get into any Windows local user account without needing a password for free! Note: Some Hirens ISOs may support UEFI booting but most do not. I recommend the Strelec builds which are updated regularly (see this blog for adding UEFI32). Remember, it is illegal to use some of the OS's and apps in HBCD unless you own a licence for them. Tip: www.rmprepusb.com has a list of useful external links (see the 'Useful External Links' page). Cheap 'upgraded' USB Flash drives for sale on eBay - again! Why do eBay allow this ad? The product is labelled based on the memory chip(s) it contains. It is also marked as a reformatted/upgraded USB stick so they may vary in speed and capacity (4GB to 64GB), though they are able to store up to 64GB of data hence the low and competitive price. These USB sticks vary in capacity and this is explained in the second paragraph of this listing which has been taken exactly as it is printed on the rear of the packaging. THESE USB STICKS HAVE BEEN UPGRADED USING THE VERY LATEST COMPRESSION TECHNOLOGY. THIS MEANS THAT EVEN THOUGH IT MAY SHOW 64GB AVAILABLE THE ACTUAL CAPACITY WILL VARY AND CAN RANGE FROM 4GB RIGHT THROUGH TO 64GB AND ONCE THIS LIMIT HAS BEEN REACHED OLD DATA WILL BE OVERWRITTEN OR NEW DATA WILL NOT BE SAVED. 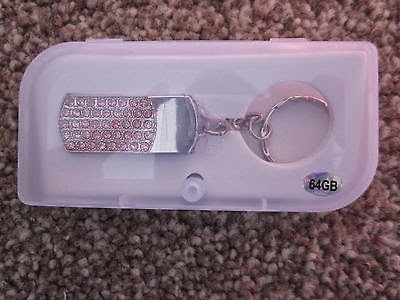 THIS IS THE SAME WILL ALL CHEAPER MEMORY STICK ON EBAY BUT MANY SELLERS DO NOT TELL YOU THIS HENCE THE VERY LOW PRICE. THESE ARE ADVERTISED AS 64GB AS THIS IS WHAT WILL SHOW AS THE AVAILABLE MEMORY WHEN IN USE. THESE ARE BEING SOLD AS UPGRADED USB STICKS HENCE THE VERY LOW PRICE. Why do they allow this seller to sell these suspect sticks as 64GB when he states in the small print that they may not be? Why does he say it has a 'very low price' when it is in an auction! There is a 14-day refund on these USB drives with 'buyer pays return postage' - but how many people will realise they are buying defective USB drives within 14 days of using them? He mentions a compression technology???? Well if he has a compression technology that can store 64GB of all kinds of data on just 4GB, why is he wasting his time selling dodgy USB drives on eBay when he could make a fortune selling the compression technology! 'The product is labelled based on the memory chip(s) it contains.' - so therefore it MUST contain 64GB of chips right? He says 'they are able to store up to 64GB of data' and 'Minimum consumer-usable memory capacity is approximately 62.2GB.' These are clear, unambigous statements - but then he says 'ONCE THIS LIMIT HAS BEEN REACHED OLD DATA WILL BE OVERWRITTEN OR NEW DATA WILL NOT BE SAVED'!!!!! If you buy any USB flash drives or SD cards, please test them with FakeFlashTest and then H2TESTW before you use it! You say in your ad that 'The product is labelled based on the memory chip(s) it contains'. From the picture, it is labelled as 64GB - so does it contain 64GB of memory chips? No its has been previosly 64gb (62.4gb) but due to its reformatting it has a different capacity depending on the uses software or device, the sticks have to be formatted using exfat and can hold anything between 8 and 64, they have to be filled using 4gb transfers at a time but depending on how they are used it is possible to get max capacity, i cannot stress though this isnt always the case hense the low price. i hope the information was useful. 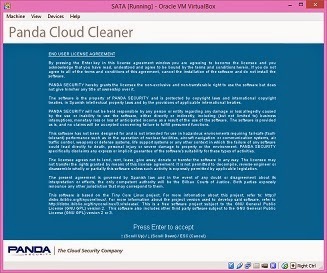 Windows Panda Cloud AntiVirus software is free (the Pro version is a 30-day trial version). Disclaimer: I have no knowledge of the efficacy or otherwise of this software and so cannot personally recommend it or not recommend it. It is rated here. The full bootable ISO can be downloaded from here which you can make a .imgPTN file from using the MPI_FAT32 shortcut. It has an option to create a bootable USB rescue disk (instructions are here). Once you have made the USB Flash drive (which supports English and Spanish), you can make an Image Partition (.imgPTN) file from it, simply by dragging and dropping the Windows drive icon onto the MPI Auto Desktop shortcut. The Panda Cloud rescue installation does not however seem to support UEFI booting so you will need to boot in MBR mode. I also don't know if it supports GPT disk format or not (as it is supposed to work on Windows 8, it should). 1. Download and install Panda Cloud AV onto your Windows system (be sure to untick the Panda Security Toolbar and the other option(s) to avoid unwanted alterations!). 2. Choose either the Basic version of the Pro version - it will then download and install the latest version from the internet. 3. Insert any old spare USB flash drive (64MB or larger - yes, I mean 64MB! ), format it as FAT32 and then choose the Rescue Kit option (see arrow below). 4. Follow the prompts to make a Rescue Flash drive (the 13MB .iso file and other files, will be downloaded from the internet and copied to your USB flash drive - syslinux will be installed onto the flash drive PBR sector and the partition will be made active). 5. Copy the whole \PandaCloudCleaner folder from the USB flash drive to the root of your E2B drive. The USB Flash drive is now no longer needed and it can go back in the junk drawer! 6. Move the \PandaCloudCleaner\PandaCloudCleaner.iso file to a suitable E2B menu folder (e.g. 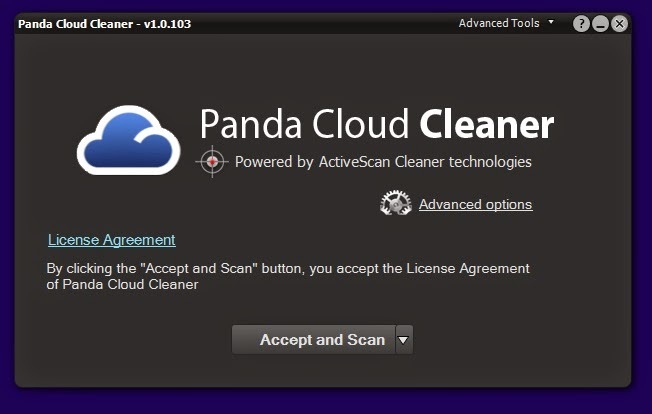 to \_ISO\ANTIVIRUS\PandaCloudCleaner.iso). 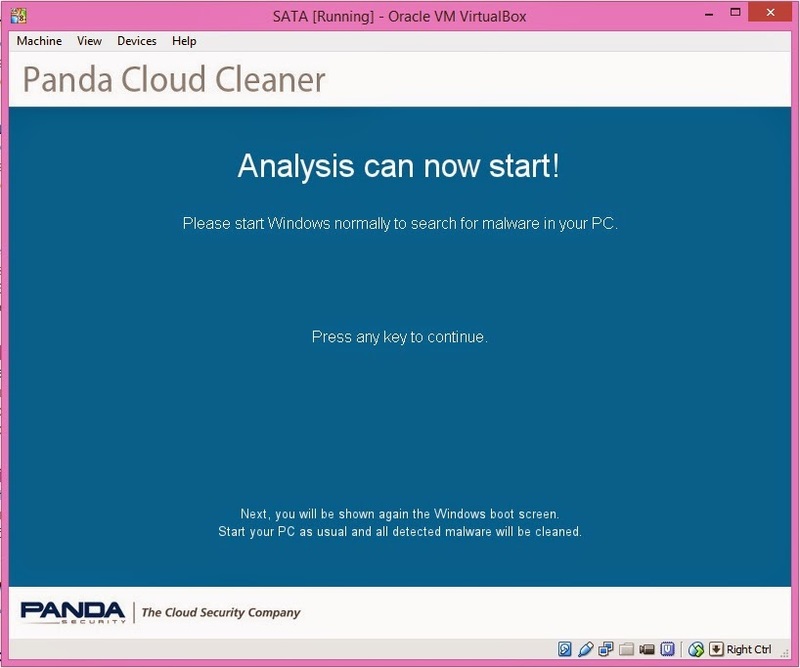 You should now be able to boot directly from the PandCloudCleaner ISO file using E2B. Check that you see the 'Setting up the PC...' message. This is where it alters your Windows installation and copies itself to the hard disk so that it auto-runs Panda when you reboot to Windows. If the PandaCloudCleaner folder is not present on the E2B USB drive then you won't see this message and it won't work! If it patched Windows successfully, you should now see this message. It may also prompt you to remove your USB drive and then automatically reboot. After accepting the licence agreement, it will check the internet for the latest definitions (if an internet connection is available) and download new ones if required before starting a scan of your system. Note: I cannot vouch for the effectiveness of this software (indeed the Pro version seemed to cause problems on my Win 8.1 64-bit system which already had Windows Defender running). 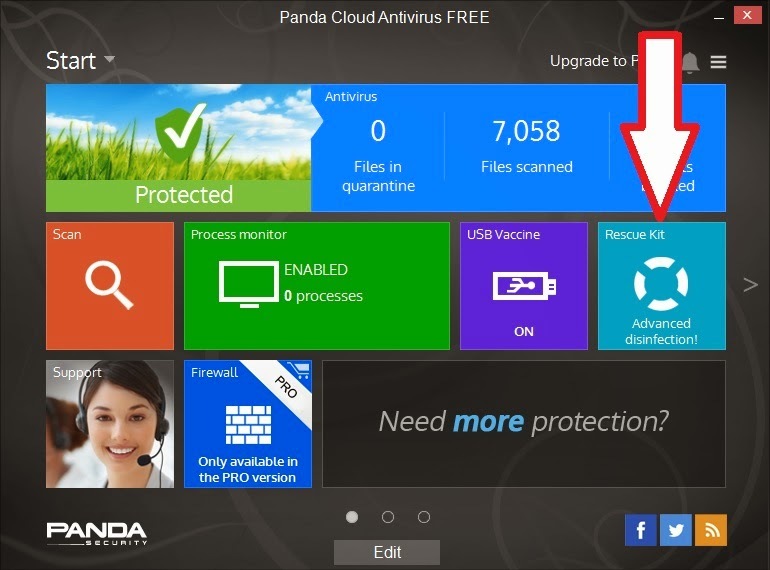 You can now un-install Panda Cloud AV from your Windows system if you wish. Please tick 'funny' 'interesting' or 'cool' or add a comment to let me know which posts you most enjoy. I have added a primitive User Forum to the Easy2Boot site. E2B users can use this to ask for help from other E2B users or offer hints and tips, etc. No login is required. Any 'inappropriate' posts will be removed without mercy! Please use it responsibly or I will remove the whole User Forum. P.S. Checkout Frettts-Freeware for lists and descriptions of free software. 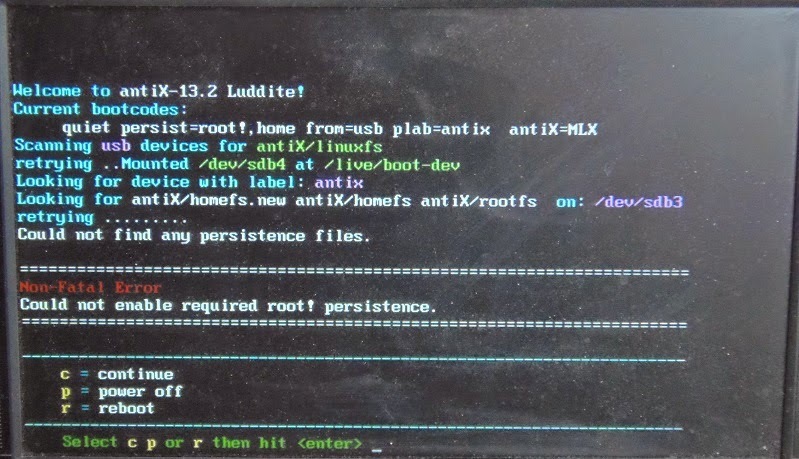 You can fully-install many linux distros to a .imgPTN file (see blog post here), however I was asked recently how to boot Ubuntu 14.04 64-bit from an Easy2Boot USB HDD when using partition image files (.imgPTN files) so that you can UEFI boot with persistence. Note: 14.04 and many later versions of Ubuntu (and linuxmate based on Ubuntu) have a bug! They do not fully boot and give an initramfs error if you use a casper-rw partition. It works OK with a casper-rw file, but not a partition. Sometimes it may work if the ext partition is located after the FAT32 partition - but this depends on the order of the two files (xxxx.imgPTN and xxxx.) so using a casper-rw partition cannot be guaranteed to always work! See later bog post here. As I am sure you know, Easy2Boot uses a grub4dos feature which can map an ISO to a partition table so that when linux boots, it sees the partition table as a valid filesystem and thus linux can mount the 'ISO file' and be able to access the files inside it. This feature uses the partnew command in grub4dos and the partnew command can only map a file as a partition if the file is contiguous (and exists on the same physical drive). I have added a new feature to E2B v1.42 which will check to see if the ISO file is contiguous and if not, it will copy the contents of the whole ISO file using dd into a pre-existing CONTIG.ISO dummy file which is already contiguous (maximum size 3.999GB). Note: v1.52+ now has a 500MB CONTIG.ISO file in the download. To use the new feature, just download and update your existing E2B USB drive with the Easy2Boot_v1.42.zip file contents (available in the Google Drive Alternate Download area here). The pre-existing file must now be created by you. It must be called \_ISO\CONTIG.ISO and needs to be as big as your largest ISO file (it must NOT exceed 3.99GB due to an issue with grub4dos). To make it, just copy your largest ISO file to the E2B USB \_ISO folder and rename it CONTIG.ISO. Alternatively, you can use the RMPrepUSB - Create Ext2 FS button to make a large empty file and then move and rename that file (it doesn't matter what the contents are inside the file). Once it is made, you must make sure it is contiguous (e.g. by using RMPrepUSB - Ctrl+F2 or DeFraggler, etc.). Once you have made the CONTIG.ISO file contiguous, you can add your ISO payload files and you won't need to defragment them each time (though it will be much faster if you do!). This new feature does NOT work for .imgPTN files or Windows Install ISOs and won't work for any .mnu files which use partnew such as linux+persistence menu files. As you can see, if you use the grub4dos 46a driver, the time is largely dependent upon the write speed of the USB drive (or approx. 30MB/s for USB 2.0 if the media write speed is faster than 30MB/s). Therefore, if you have a large ISO which is fragmented, it is probably quicker to first select grub4dos 0.4.6a from the main E2B menu and then select the grub4dos USB 2.0 Driver menu option to load the grub4dos driver first as it seems MUCH faster than the (Asus EeePC) BIOS USB 2.0 driver. Larger files will obviously take several minutes to copy even if using the grub4dos USB driver. However, at least you can boot a fragmented file if you forgot to make it contiguous first! A USB 3.0 HDD will be faster, a USB 2.0 cheap flash drive will be slower. If CONTIG.ISO is not present, then it will just behave as before (and warn you that the ISO is not contiguous). As this change is very new (and I may have broken something - though I have tested it), I have not updated the links on the Easy2Boot download page yet. Please let me know if it works for you (or not)! Note: a 500Mb CONTIG>ISO is now included in the E2B download zip file as standard! Tip: To boot to grub4dos 0.4.6a automatically, copy the file from \_ISO\e2b\grub\grldr_046 to the root of the E2B drive and rename it to grldr to replace the 0.4.5c version of grldr - AND/OR - add a \_ISO\MyE2B.cfg file by copying the Sample_MyE2B.cfg file and uncomment the line 'set GRUB_USB=Y' to automatically load the 0.4.6a USB driver when E2B loads. Pressing Ctrl+F2 was too much effort to run WinContig each time I added a file to my USB drive, so now I can just right-click on the drive in the RMPrepUSB Drive listbox to run WinContig immediately, or right-click on the Refresh button to run WinContig on the currently selected drive. I have also updated the versions of WinContig and HashMyFiles. The new version is here. Just in case didn't know, if you format your SD card or Flash drive as FAT32 (which is used by many SD cards in cameras), then by formatting it using RMPrepUSB you can increase the write performance by up to about 10%. This speed increase can only be measured when writing files - many benchmark tests will not show any increase in write speed because they do not write files when they run their tests. However, in real life, we write files to these devices and the files are written in groups of sectors called clusters to the FAT32 filesystem on the drive. When you format a drive as FAT32 using RMPrepUSB, the clusters are aligned to start on a 1MB boundary. This is important for flash memory because in order to write sectors, a whole page of flash memory has to be erased first. RMPrepUSB ensures these 'erase-pages' are correctly aligned with the clusters to minimise the number of erase cycles that are required. This also has the side-affect of extending the life of your flash memory as it reduces the number of read-erase-write cycles over it's lifetime. If you want to read a discussion on reboot.pro about this, click here. The theory for how this works is explained in this post. So if file-write speed is an issue for you (e.g. the delay after you press the camera button to take a picture or interval between a series of pictures, or when you copy lots of files to a FAT32 USB drive) try formatting the media with RMPrepUSB next time! Since I 'discovered' this and added this enhancement to RMPrepUSB, it has been copied by a few other people/utilities. For instance, I believe BootIce now uses the same technique now too. If you have RMPrepUSB or VirtualBox+DavidB's VMUB utility on a Windows system, you can boot from an E2B USB drive under a virtual machine and 'swap in' any image partition file you wish, so that you can pre-select it before you boot from that same E2B USB drive on a different 'target' system. MobaLiveCD.exe (1.5MB) is a 'shrink-wrapped' version of QEMU and so will also allow you to boot your E2B USB drive via QEMU (similar to RMPrepUSB's QEMU F11 button in RMPrepUSB). 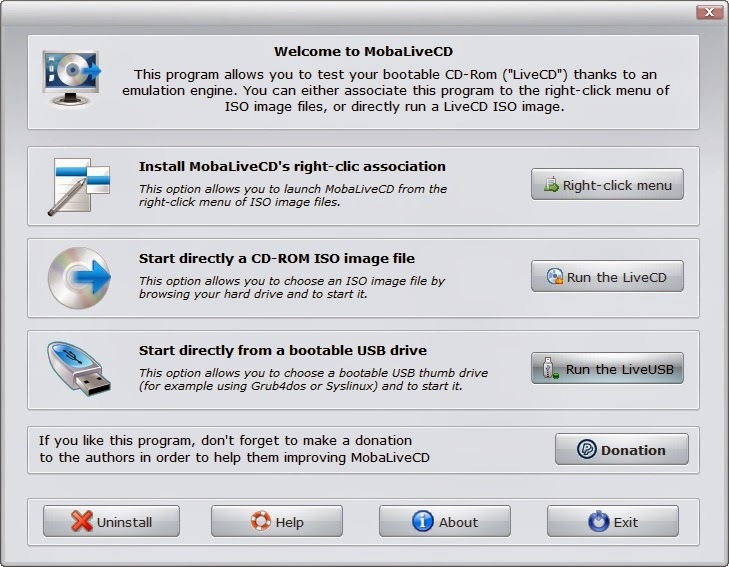 The difference is that MobaLiveCD is designed to be portable and does not need to be installed on a Windows system first. Just copy the .exe file to your E2B USB drive and it is ready to use if you are away from your Windows system or don't have access to a VM (e.g. off-site or at a friends house). 5. Say 'No' to the 'Do you want to create a hard disk image for your virtual machine?' question and allow it to boot to the E2B menu. You can also directly boot using MobaLiveCD from an ISO file (32-bit ISOs only). Note: As an alternative, you can unzip the BOOT_ME_USING_QEMU.zip file from the Alternate Downloads Area to your E2B USB drive and then double-click on the BootUSB.cmd file to boot from the USB drive under QEMU. This should only be used for select .imgPTN files however as it does not create a virtual hard disk, does not lock the drive like RMPrepUSB does and uses a fixed memory size of 500MB. Microsoft is giving away Windows 8.1 for free! Yes - that's right free! There were rumours that the price was going to drop significantly. According to this article and recent reports in the Press, Microsoft will be giving device manufacturers 'Windows 8.1 with Bing' for free (sorry - not free for the general public!). I am guessing this will mostly apply to small device manufacturers producing tablets and phablets ('Windows Phones and tablets smaller than 9-inches in screen size'). I am also assuming that the OS will still be locked to the device by a Product Key embedded in the device's non-volatile RAM (usually an EEROM) and so will be pretty much identical to the normal Windows 8.1 core version. So has Microsoft gone mad? Is android/iOS/ARM such a threat to it? My take is 'No - they haven't gone mad' and 'Yes - android/iOS is a threat'. See here for current usage (and compare with Desktop OS's). The problem is one of momentum - if you were an mobile app developer, what platform would you choose to produce your first and seconds versions of your new app? Not Windows, I am guessing! The reason is that there just aren't enough devices out there. Well, if Microsoft's gamble pays off, now there could be! But with MS it's all about money - so how are they going to make money? The answer is hidden in that sentence about developers and apps. MS make money on every app sold. They also want to make money from selling Office 365 subscriptions (and Office). The more people that have a Windows device, the more 'opportunity' there is to sell apps and Office. Once Windows 8.1 gains a foothold, they can always start charging OEMs for Windows 9! For any current non-Windows OEM, the 'factory systems infrastructure' required to install Windows 8 and have it ready to be activated by the end user may be a cost barrier (the Product Key presumably needs to be embedded in the device which implies BIOS modifications and factory programming on an individual device level which presents a barrier for easy mass-production). There is still a minimum specification for memory, storage, CPU speed/type and CPU power requirements which may prove challenging for a low-cost device manufacturer. Would a 'Windows' customer really choose to buy a sub-£100 device with limited memory and storage? If the 'free' offer applies to a wide range of devices, not only low-cost ones but all 'portable' devices, then I think it will work - but maybe not as much as MS hope. In the short term this may also harm MS's profits because their current OEMs that are already producing Windows devices will be switching to the new 'Windows 8.1 with Bing' OS pretty quickly and saving themselves a few $ in the process. An increase in sales of Windows devices will eventually prompt the other non-Windows device manufacturers to compete and also offer Windows devices. It also means, if you are looking for a Windows device at the moment - I should wait a few months - prices should come down when the 'new' models start to hit the shelves with free Win 8.1. Non-Windows device manufacturers will need to compete with this and so they too should reduce their prices. Note that before the new 'Windows 8 with Bing' Models start to appear, prices of the current 'Windows 8' stock will be reduced to clear before the new models start to come in. It is up to you whether to be tempted by the reduced price of these models or hold out for the new models (which should have an even lower price). This move by MS should therefore lead to an increase in sales of x86-compatible CPUs (I am ignoring the RT version here as I think this new 'free' OS will pretty much kill it, if it wasn't already slowly dying) - so maybe time for me to invest in a few Intel shares (currently at time of writing this blog June 2014 - Intel shares = $26)? Note: Dec 2014 - Intel shares = $36! The term 'boot' in my mind has always been synonymous with 'bootstrap' - a process where code is pulled up by it's own bootstraps - i.e. loaded in stages, starting with a small piece of code which then loads in a larger piece of code which then loads in an even larger piece of code - etc. etc. until we get to a full Operating System. Many years ago, I used to key in the initial octal bootstrap code using the flip-keys on a PDP 8e, which then read in a bootloader from a paper tape reader which could then read in a programming language (e.g. Algol) which could then read in an Algol program from paper tape which could then read in a whole bunch of data from yet another paper tape and finally number-crunch and draw a nice graph and 'best-fit' curve on a giant pen plotter! I always find the Microsoft-speak terms 'boot partition' and 'system partition' confusing. Even more so when GPT-partitioned disks came along. The first sector of a bootable hard disk (if an MBR style disk) contains bootstrap code in the Master Boot Record (note the word 'boot' just appeared twice!) - so surely this is the 'boot partition' not the 'system partition'? So it made me chuckle to find it in 'black-and-white' that even windows.microsoft.com admits it! Now bootmgr is what most Windows installations boot to first, and bootmgr is a 'boot manager'; so we have bootstrapped to a 'boot manager' and then the boot manager can load an OS. Therefore the partition containing 'bootstrap' code should be called the 'boot' partition and the partition(s) containing the operating system should be called the Operating System partition(s). So how should I refer to these partitions without ambiguity? Maybe I should use the terms 'bootstrap partition' and 'OS partition'? What is your opinion? Trust MS to totally screw everything up! tacovdveer pointed out that sub-folders under \_ISO\AUTO were no longer enumerated due to a bug I accidentally introduced in v1.40! Now fixed in v1.41. If you are updating, just download the non-DPMS version and overwrite your existing E2B files.